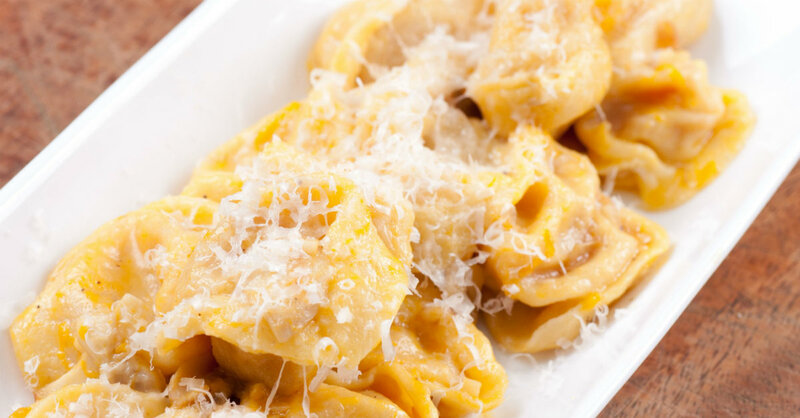 These Pumpkin Tortellini Are Absolutely Worth The Effort! There are so many great ways to cook pumpkin, from baking it in a pie, to toasting up some seeds, or to turning it into a soup or puree. One of our favorite meals involves loading tortellini with fresh pumpkin. The stuffed pasta, tortellini, has its roots all the way back to 14th century Venice. It was originally stuffed with a mixture of herbs, egg, and cheese, and that basic recipe has stuck around to modern days. But somewhere along the way, pumpkin became a popular filling in northern Italy, particularly in and around the region of Emilia-Romagna in the north. They’re still eaten year-round, made fresh in bakeries, and celebrated as a key component of local culinary history. Now you can make these legendary tortellini right at home. This recipe offers up a spectacular combo of sweet and savory, mixing together pumpkin puree with shallots, herbs, and some heavy cream. Place the flour in a large bowl, then make a well in the center. Beat together 5 eggs and oil, then pour into the well in the flour. Stir together, forming a ball. Place the dough on a floured surface, then knead until smooth and elastic, adding flour if necessary to keep the dough from sticking. Cover, and let rest for 30 minutes. In a large skillet, sauté pumpkin and shallot in butter until tender. Transfer to a food processor, then add sage, thyme, salt, and pepper. Cover and process until blended. Return the mixture to the pan, stir in the cream and bay leaf. Bring to a boil, stirring constantly. Reduce heat, and summer uncovered for 15-20 minutes or until thickened. Discard the bay leaf. Divide the pasta dough into fourths. Roll one portion to 1/16″ thickness, then cut each sheet of pasta into 2-3-inch squares. Quickly place small, rounded spoonfuls of filling on each square of pasta. Brush around the edges with the beaten egg. Fold your pasta square in half diagonally, and press edges down to seal. Take the two smaller points of the pasta triangle, bring them together and press to seal. Bring a pot of salted water to a boil. Add tortellini, and simmer for 1-2 minutes, or until pasta floats. Drain. In a small saucepan, bring the heavy cream to a boil. Let cook uncovered until reduced by half. Stir in butter and sage. Serve over tortellini and garnish generously with parmesan cheese.